It’s been announced that the National Trust has today succeeded in it’s campaign to acquire Seaton Deleval Hall, regarded as one of the finest Baroque houses in England. However, the success in securing the future of the hall has again come about as a result the damage caused by inheritage tax leading to treasures – usually art or antiques, but sometimes buildings – being taken into ‘national’ ownership rather than remaining in private hands. Seaton Deleval Hall was built for Admiral George Deleval by Sir John Vanbrugh and was completed in 1871. Vanbrugh’s other notable commissions included Castle Howard and Blenheim Palace. However the house suffered a devastating fire in 1822 which gutted the central block which remained as a shell until 1980 when the 22nd Baron Hastings (Edward Delaval Henry Astley) partially restored it. The 22nd Baron and his wife both died in 2007 triggering a significant inheritance tax bill. It was this that led to the house being put up for sale and the start of a fund-raising campaign to save it for the nation. The house and 400 surrounding acres have now been accepted in lieu of £1.7m of tax (the first time since Calke Abbey in 1984) with the contents covering a further £3.2m. The National Trust have generously contributed £6.9m to the endowment with a further £3m raised to cover other costs associated with opening it to the public. The first visitors are expected to arrive in April 2010, part of an estimated 50,000 a year who will be able to see one of Vanbrugh’s masterpieces. So whilst there is a success in that the house will now be secure and not carved up into flats, it’s still a shame that another part of our national architectural heritage is denied its primary function of being a home. Inheritance tax has a pernicious creep – it can’t be avoided and just results in each generation selling off more historic artefacts to fund government budgets. Give it a few hundred years and one conclusion could be that a majority of the crowning jewels of our artistic heritage including buildings, art and antiques could well end up being owned by a national organisation, be it the National Trust or the galleries. For me, the art treasures of a nation are best located in the houses and families for whom they were produced or bought for, rather than part of a vast national archive, only brought out once a decade or less. Inheritance tax makes a relatively small contribution to the national budget but it does have a disproportionate impact on our cultural heritage. 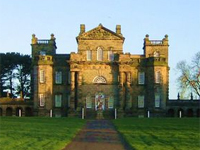 This entry was posted in News and tagged architecture, conservation, country house, listed, national trust, northumberland, parkland, restoration, seaton deleval hall, sir john vanbrugh. Bookmark the permalink.